April 20th is right around the corner! Which means it’s time to purchase all of your cannabis paraphernalia. As cannabis becomes a hot topic issue in the United States, the popularity of Cannabis related items rises. 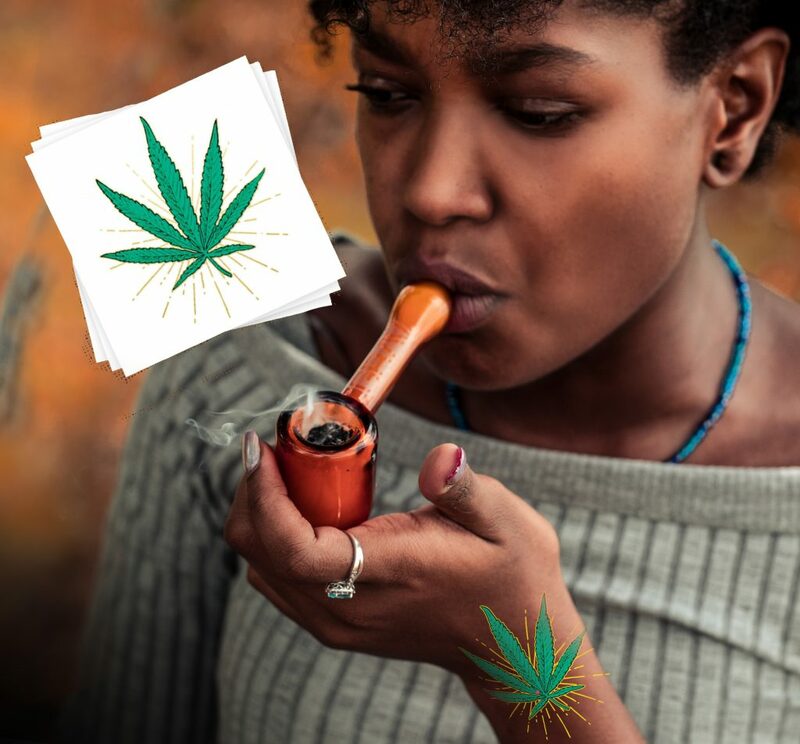 This 4/20, consider purchasing Cannabis temporary tattoos from TattoFun.com. At TattooFun.com, we advocate for the rights of the people. We take pride in the right of adults to smoke weed responsibly. We believe cannabis should be legal for recreational and medical uses. That’s why we carry a pack of Cannabis Temporary Tattoos. Our Cannabis 420 Pack features a variety of 420 themed tattoos for you to wear this April 20th. I Leaf 420… do you? Featured in our pack of Cannabis temporary tattoos is a tattoo that reads “I Leaf 420”. This temporary tattoo has a Cannabis leaf as the “heart”. 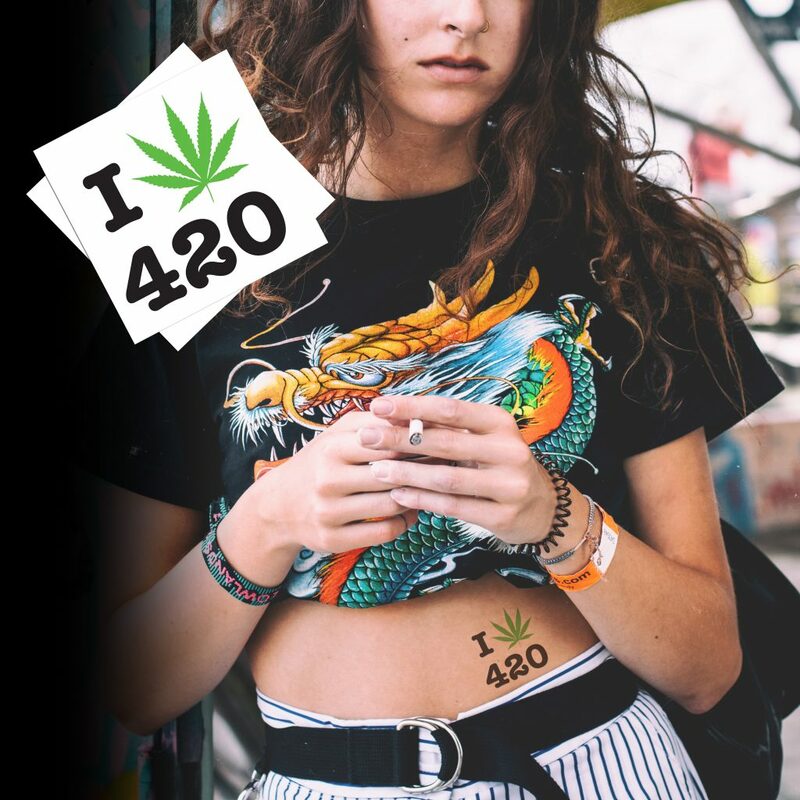 This April 20th, wear this temporary tattoo as a symbol that you love 420 and aren’t afraid to show it! The pack comes with two of each tattoo. Thus, you can Rock these Cannabis temporary tattoos on your face and on your arm or leg. Above all, 420 Day is all about showing your love for Cannabis. So why not do so by wearing “I Leaf 420” Cannabis temporary tattoos? Additionally, our Cannabis 420 Pack features several Cannabis temporary tattoos with gold foil! So no, you aren’t trippin’, that temporary tattoo does have gold smoke coming out of it. (On the tattoo that is). This temporary tattoo has gold foil wrapped around a Cannabis plant. What could be better than that? 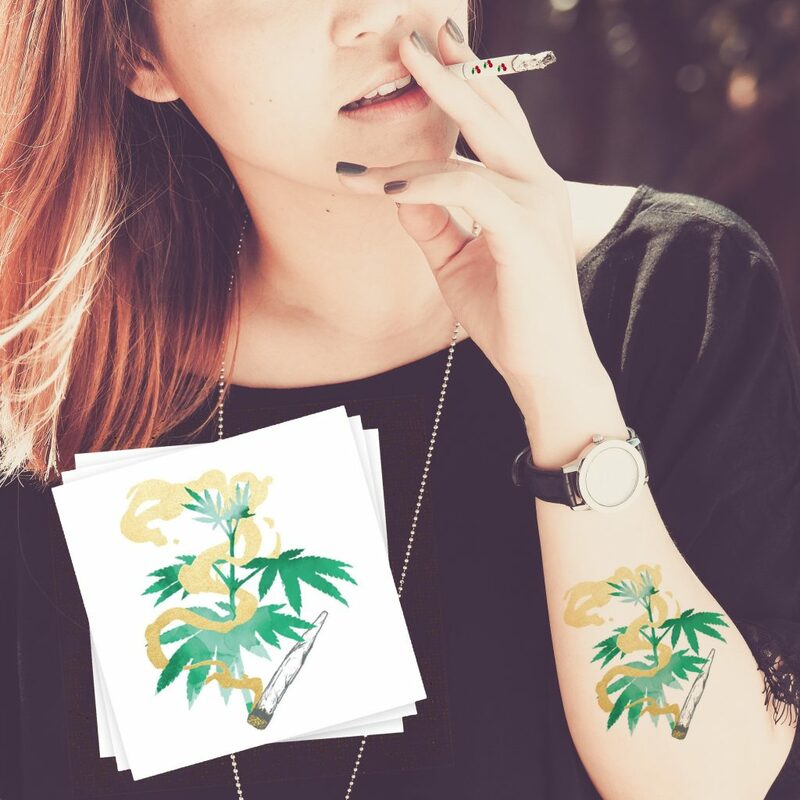 Wear these either of these Cannabis temporary tattoos as a statement piece to show how much you love 420. Our Cannabis Pack also features four metallic joint Cannabis temporary tattoos. There is two silver and two gold joint temporary tattoos. 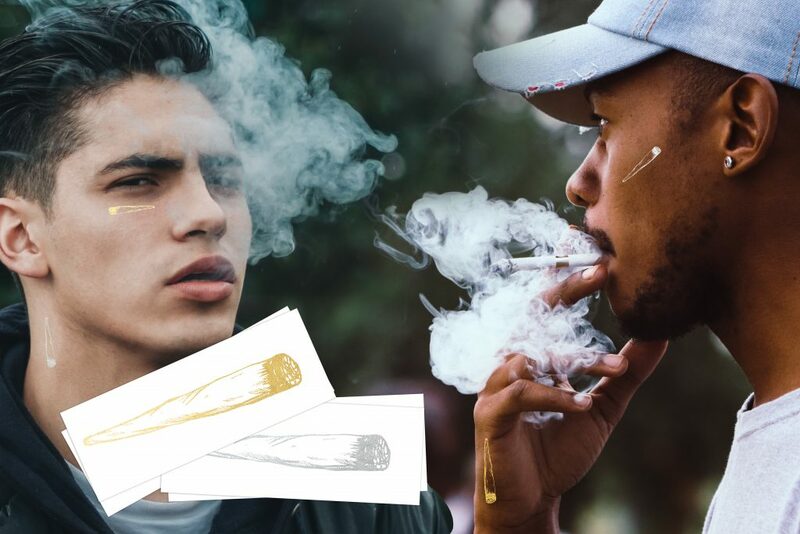 This way you can hand out metallic joint Cannabis temporary tattoos to 3 of your closest friends. While you smoke on 420 you can all wear your metallic joint temporary tattoos to show your love for cannabis. Your friends will love them and it will make for great Instagram pictures. Make sure to use the hashtag #TattooFun420 so we can see your Cannabis temporary tattoos! Another temporary tattoo in this pack is the Metallic Cannabis leaf. This tattoo features a large Cannabis leaf with gold accents surrounding it. This tattoo really shows the significance of the cannabis leaf. The pack comes with two Cannabis leaf temporary tattoos. This way you and a friend can both wear Cannabis temporary tattoos. You could also consider wearing them both to really show your Cannabis love. We know you’ll be on bowl patrol all day on 420. Thus, our Cannabis pack features a Bowl Patrol badge. 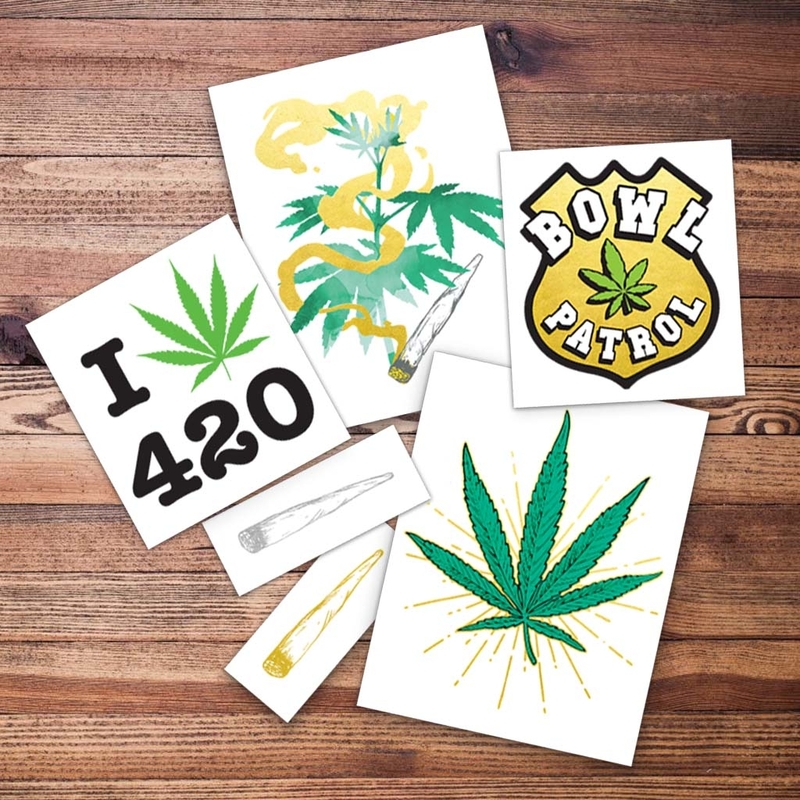 These Bowl Patrol Cannabis temporary tattoos will show the world you are hungry for bowls of Cannabis. The irony of the tattoos lies in the police-like vibe of the badge. Although you aren’t looking to outlaw bowls, you are just looking to smoke them. Looking for custom Cannabis Temporary Tattoos? If you are looking for custom Cannabis temporary tattoos we can help! Purchase our custom temporary tattoos and design them for 420 day. If you need help with a custom design, our graphics team can help. A small design fee may apply. However, we are more than happy to help your Cannabis temporary tattoos become a reality. All of these Cannabis temporary tattoos are easy to apply, and only require a little water! Simply put the temporary tattoo against your skin and apply a damp cloth to the backing for 30 seconds. The best part of temporary tattoos is that they stay on for days. However, you can remove them at any time with rubbing alcohol or, even just a little hand sanitizer. (There is also specially formulated temporary tattoo remover available). We’ve been in the Temporary Tattoo business for over 20 years. Thus, we know a thing or two about what type of temporary tattoos people love. We ship millions of temporary tattoo sheets all over the globe each month. Additionally, we make all of our temporary tattoos in the good old USA. We also make all of our temporary tattoos with skin safe, FDA approved ingredients. Above all, we offer the best quality temporary tattoos, every day low prices, excellent customer service, and your satisfaction is guaranteed!